A couple of years ago when memories of the credit crunch's pain was fresh -- and many were still suffering -- this column regularly covered the threat posed by card debt. Indeed, when bankers again started to market plastic to sub-prime borrowers, we accused, in Credit card lending: Bring on the tripping goldfish, the executives who run credit card companies of lacking the attention span of goldfish swimming in an LSD solution. The latter half of 2012 saw an end to the fall in the percentage of credit card accounts that were 90+ days delinquent, a trend that had been continuing since March 2010. Instead, that percentage began to creep up again, and by the end of last year was around 11 percent. Looking at all forms of debt (not just credit cards), in Dec. 2012, an astonishing 14.6 percent of all consumers had an account in collection by a third-party debt collector (not the company to which they originally owed the money). The Fed says that most of these debts probably relate to outstanding medical and utility bills. In all (so including "good" debt, such as mortgages), American consumers owed $11.34 trillion in the fourth quarter. That was up $31 billion (0.3 percent) on the previous three months, and was a reversal of the downward trend seen since a peak of $12.64 trillion in the third quarter of 2008. The total (aggregate) value of card credit limits dropped very slightly (by $9 billion or 0.3 percent) in the last quarter of last year. 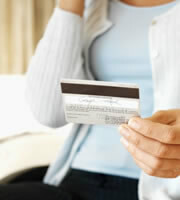 Credit card debt has upsides and well as downsides. For example, many argue that the economy won't fully recover its usual vibrancy until consumers regain confidence, and once more begin borrowing less cautiously. So you can read positively -- at least for the nation's wider economic fortunes -- some of the data that have been reported here negatively. The problem arises on a personal level when people get used to using their plastic to indulge their whims, and then run up balances they can't comfortably manage. And it arises for whole economies when too many people do that. That's absolutely fine for those to whom debt is no bother. But paying down by $2,805 a card balance that's attracting 16.82 percent APR (the average credit card rate at the time of writing) could save someone close to $500 in interest alone over the next year -- more, if they use that savings to pay down their balances further each month. That's generally not as much fun as a vacation, but it's worth thinking about. 0 Responses to "Credit card debt problems could make a comeback"